What kind of teeth whitening will help my veneers? Diana – There is no form of teeth whitening that will brighten your veneers. Porcelain veneers are colorfast. Although you suspect that your veneers are not made of porcelain, the material they are made of isn’t responding to teeth whitening. You can find out whether or not your veneers are porcelain by visiting an experienced cosmetic dentist. But the dentist won’t be able to change the color. At times, the condition or color of natural teeth beneath the veneers can cause them to look darker. If that’s not true in your case, it is possible that a skilled cosmetic dentist can polish the veneers and make them look better. Otherwise, your solution is to replace them. 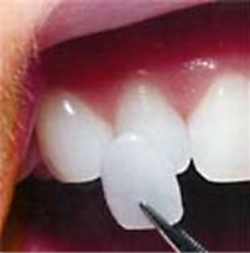 Porcelain veneers are bonded to your natural teeth. They are colorfast and cannot be whitened. Quality porcelain veneers can last ten to twenty years or longer. They will remain white if you properly care for them at home, and only have your veneers and teeth cleaned by a dentist and hygienist who have been trained to clean veneers. Whenever you decide to replace your veneers find a talented, accredited cosmetic dentist to do the work. Accredited cosmetic dentists have received extensive training in aesthetic dentistry (making your teeth look beautiful, not just functional), and they have passed exams and submitted patient cases to demonstrate their expertise. You’ll get the smile you want, and it will last.